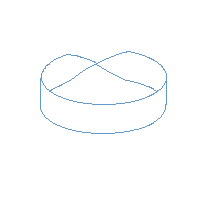 The Möbius Band is a somewhat peculiar three-dimensional object. Follow the instructions and you will see why! Take a piece of paper, approximately 3 cm × 30 cm. Turn it into an ordinary ring. This ring has two sides, inside and outside. It also has two borders, one upper and one lower. This is NOT Möbius Band and not very peculiar. ...turn it into a ring you'll have your own Möbius Band. Use glue or tape to hold the ends of the strip together. Now, what's so peculiar about this? Well, how many sides and how many borders does your band have? Who was August Ferdinand Möbius? 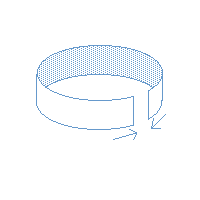 This site features a rotating Möbius Band. You will also find some experiments you may perform on your strip. 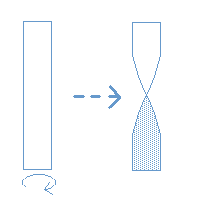 There are also other images of similar objects.